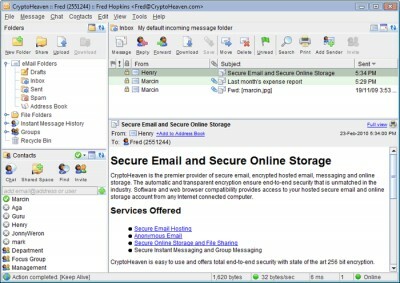 CryptoHeaven offers secure email and online file sharing/storage. 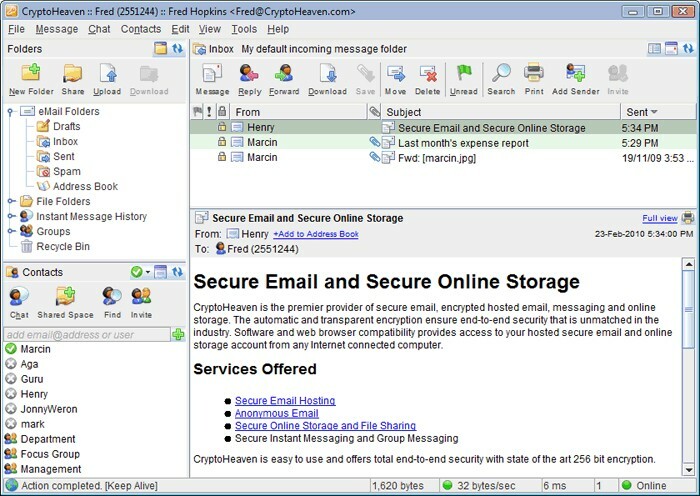 It integrates multi-user based security into email, instant messaging, and file storage and sharing in one unique package. It provides real time communication for text and data transfers in a multi-user secure environment. The security and usability of CryptoHeaven is well-balanced; even the no-so-technically oriented computer users can enjoy this crypto product with very high level of encryption. CryptoHeaven is easy to use and offers total end-to-end security with state of the art 256 bit encryption. CryptoHeaven offers free and premium accounts. Use CryptoHeaven and communicate in total privacy. CryptoHeaven is by far the easiest to use secure communications service, all you have to do is just download a small client front-end. CryptoHeaven is developed to accelerate wide spread use of highest-grade cryptography and distributed without restrictions upon its further dissemination. CryptoHeaven is a user-friendly, no-compromise information-heaven crypto system, where no third parties, including server administrators and others, have access to plain text version of transmitted information. Information is stored in encrypted form on the server as generated by the client, and only the sender and the recipient possess the keys to gain access to the information. Having the entire log of all transmissions made and all of the data stored on the server does not give access to the plain text version of information. system free from any type of snooping and interference, including any and all types of governments and "authorities". Folder Tree has been changed to visually separate secure email, secure file storage/sharing, and secure instant messaging functions. Spam filtering has been improved.